Chilewich solved our problem, but the experience also made us think about fun coasters we could make ourselves. After a bit of research, we found some fabulously creative ideas. Below are our favorites. The Canadian Blog Poppytalk gives us instructions for creating fantastic color-blocked wood coasters. Fellow Fellow created festive coasters using only two things: Cork and a Metallic Pen! Oh So Lovely Vintage jazzes up some simple coasters with vintage inspired patterns. Now that we all play Word with Friends, you can recycle your Scrabble pieces to make these coasters as shown to us by Domestic for Dummies. The Cottage Home gives us step-by-step instructions to create these colorful tile coasters. 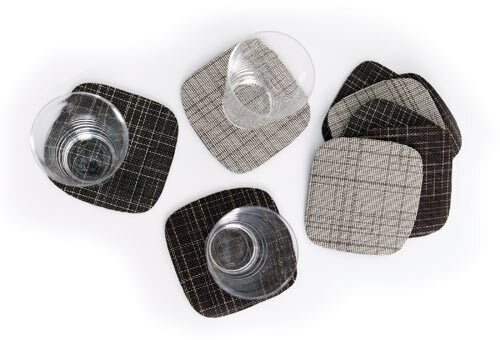 No time to make your own coasters? Don't fret! If you find yourselves with water rings one your wood furniture, refer to this removal guide by Real Simple Magazine.